Microsoft took the wraps off its Surface Windows 8 tablet on Monday at a last-minute special event in Los Angeles, marking the tech monolith's entrance into the iPad-dominated tablet market. Microsoft CEO Steve Ballmer, showed off the tablet computer based on the company's new Windows 8 operating system he called "the new Surface," reports Engadget. After giving a brief history of Microsoft-branded hardware like the venerable mouse and keyboard, Ballmer introduced the new device, likening it to the Xbox 360 in that it has a strong synthesis of software and hardware that push each other to new limits. Microsoft's President of the Windows and Windows Live Division Steven Sinofsky proceeded to show off the 10.6-inch multi-touch tablet, which features a magnesium enclosure called "VaporMg" with built-in stand, dual MIMO arrays, an optically-bonded proprietary display with Corning's Gorilla Glass 2 and a variety of input ports. The unit is also coated with vapor-deposited magnesium (PVD) to avoid scratching. 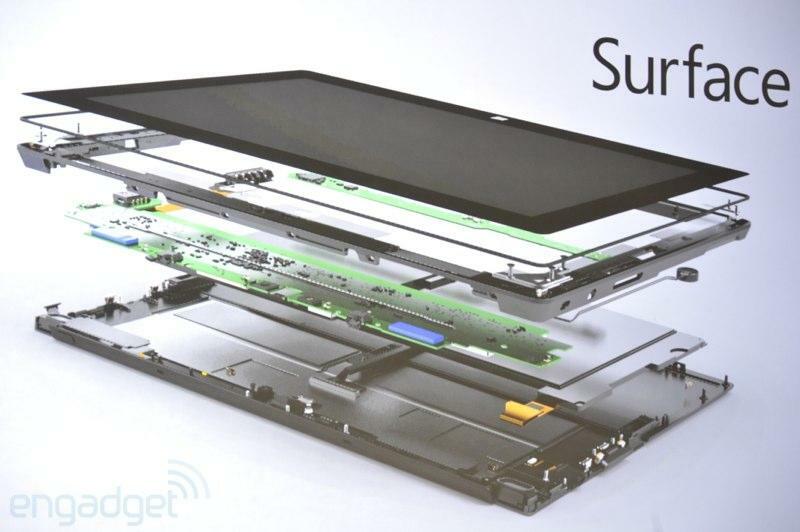 Surface will be sold in two distinct incarnations with one touting an Ivy Bridge i5 processor while the other will feature a low-energy NVIDIA-made ARM cortex CPU. The Intel model, called Surface for Windows 8 Pro, will weigh in at 1.9lbs at 13.5mm thick and feature a 10.6-inch 1920-by-1080 pixel ClearType full HD display. 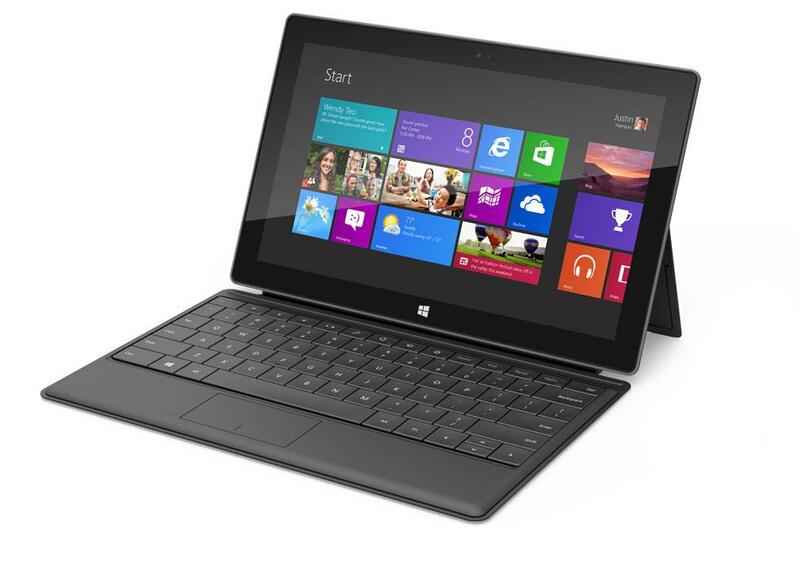 Input and output for the higher-tier Surface is handled by USB 3.0, Mini DisplayPort and an microSDXC card reader. The thinner ARM cortex version will be released under the Surface for Windows RT moniker and will come in at a trim 1.5lbs and 9.8mm thick but bumps specs down to a 1280-by-720 pixel screen. Handling the heat put out by the Intel chip is what Microsoft calls "perimeter venting" or a series of integrated vents encircling the edge of the bezel, which itself is beveled. While the Windows RT model doesn't carry the high-powered connectivity as its bigger brother, it still manages a microSD slot, USB 2.0 and Micro HD Video. Accessories for both units include the "Touch Cover" which is a full multi-touch keyboard complete with arrow buttons that changes the color of Surface's screen to the color of the cover when attached. Much like Apple's Smart Cover, the Touch Cover also turns the device on and off presumably through use of magnets. 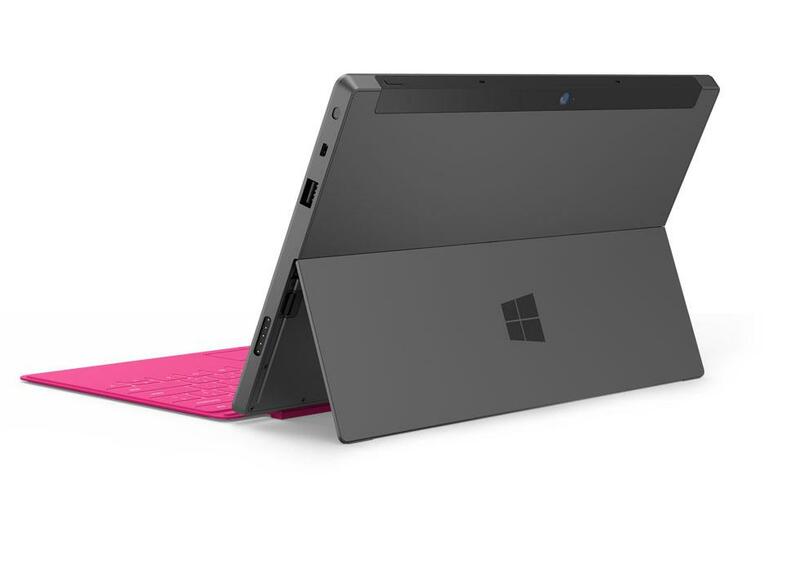 The Surface "Type Cover" accessory brings physical switch-type keys and a clickable trackpad, though the part adds 5mm of girth to the tablet. The Surface supports palm-blocking Digital Ink technology and can mark up PDFs and other supported documents with a digitizer, though the feature seems to be limited to the Intel model. It is unclear what company is manufacturing the tablet for Microsoft, though the product itself looks to be a branded device with prominent Windows logos adorning the screen bezel and the back kick-stand. The debut of the ARM-based Windows RT version of Surface is set to coincide with the launch of Windows 8 and will be available in 32GB and 64GB flavors. Pricing will be in-line with competing ARM tablets. 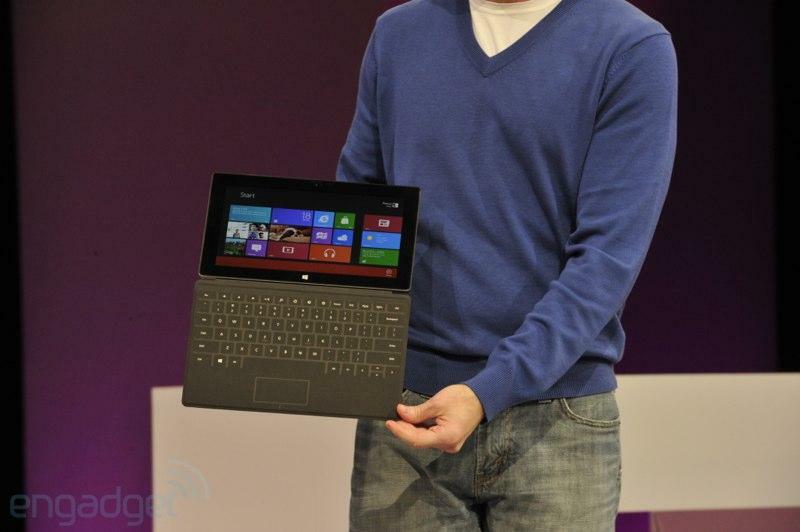 The Intel Ivy Bridge i5-based Windows Pro Surface is slated to follow about three months later and will be sold in 64GB and 128GB capacities with prices comparable to Ultrabook PCs.